17 January, Feast of Saint Anthony: The man who knew he was praying. S. Anthony said that a man who knew he was praying was not praying. He meant that what was spontaneous and natural was most real; what was most studied and most conscious tended to lack reality. Often I have heard people say they could pray to God while they were walking about and doing their chores, but that as soon as they knelt down they were plagued with distracting thoughts. The truth about that is that they prayed best when they were least conscious of themselves. from The Life and letters of Fr Andrew, London, Mowbray, 1948, p210. We Catholics say the words at every Mass: ‘Lord, I am not worthy that you should enter under my roof.’ We know the Centurion of the lakeside garrison at Capernaum addressed them to Jesus, and they are a timely reminder of our unworthiness and sinfulness. But when Father Anthony read the passage from Luke 7 recently, I heard a subplot that I found interesting. A certain centurion’s servant, who was dear to him, was sick and ready to die. So when he heard about Jesus, he sent elders of the Jews to Him, pleading with Him to come and heal his servant. I am not worthy that You should enter under my roof. Therefore I did not even think myself worthy to come to You. But say the word, and my servant will be healed. It is not clear that Jesus ever entered the Centurion’s house, or met him outside. But the intercession of the Centurion’s friends to Jesus was prayer enough. The servant was healed. At All Saints’ tide I take three lessons I take from this story: firstly, to pray for others, as the Centurion’s friends do; secondly, to be open to praying to the saints, and thirdly, to put this text before any evangelical friends who shy away from doing so as ‘un-Biblical’. You don’t have to pray to the saints ( although the standard prayer in the Litany is ‘Saint N., pray for us’) – but it may help! 5 October. Little Flowers XXXXI. Francis and the Robbers, 2. Yesterday we read how Brother Angel, the guardian, chased away the three robbers who came begging at the friary. Francis sent him to bring bread and wine to them, bread and wine that he himself had begged. The obedient guardian came up with the robbers and offered to them the bread and the wine, and said all that Saint Francis had laid upon him. say among themselves Woe unto us, miserable wretches! how grievous are the pains of hell that await us, who go about not only robbing our neighbours, and beating and wounding, but likewise slaying them; yet we feel no whit remorse of conscience, nor fear of God; and lo! this holy brother that hath come to us and humbly hath confessed his fault for diverse words he justly spake against our wickedness; and more than this, hath brought us bread and wine and so bounteous a promise from the holy Father; of a truth these be holy brothers of God, and merit the paradise of God; and we be sons of eternal perdition and merit the pains of hell, and every day increase our own damnation; and we know not whether we can turn us from the sins that we have done up till now. Come, what is it that we needs must do? Through the which words and the like admonishments, the three robbers renounced the devil and all his works. And Saint Francis admitted them into the Order. 22 September: Saint Maurice, a book review. Looking back, I realise that my teacher Miss ‘Killer’ was an ignorant woman. She ridiculed children who had not been baptised with what she considered to be appropriate saints’ names. ‘There’s never been a Saint June!’ she once spat, instead of saying, ‘You could stick with Saint Jane or Saint Joan.’ As for ‘Royston’! ‘What kind of a name is that?’ Life was miserable if you were on the wrong side of her, as a good 75% of us regularly were. I’m glad she did not pick up on the idea that Saint Maurice did not exist; it would have been another stick to beat me with. And I mean beat. The theory was that since there were no contemporary accounts of Maurice and his companions, they were more likely a group of saints invented to make sense of a mass grave found in Switzerland in 383 AD, said to have been Christian legionaries executed for refusing an immoral order. 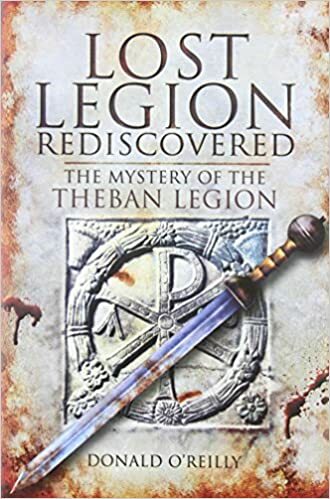 Donald O’Reilly in Lost Legion Rediscovered settles the Question to his and my satisfaction: there was a Christian Theban legion – from the Egyptian Thebes, not the Greek one – and in the late 3rd Century civil war its members were killed in great numbers for disobeying an immoral order, and this happened not only in Switzerland’s town that bears his name but across North West Europe. O’Reilly’s detective work is well worth reading, giving insight into Roman civil and military life of the time, and into Christian attitudes to military service. Yes, St Maurice did exist, an African in Europe, which is why his town is now the focus for the annual African pilgrimage to the saints of Africa every June. Here is part of a speech attributed to Maurice by a later writer (p121 of O’Reilly’s book). Our right hands know how to fight against wicked men and enemies; they do not know how to cut into pieces innocent men and fellow citizens. We remember we took up arms on behalf of citizens rather than against citizens. We have always fought on behalf of justice, on behalf of the safety of the innocent; up to the present time this has been the reward of our dangers. We have fought on behalf of the faith; and how are we to keep our faith towards you – the words are addressed to the emperor – if we do not show forth faith to God? Donald O’Reilly, Lost Legion Rediscovered, Barnsley, Pen and Sword, 2011.